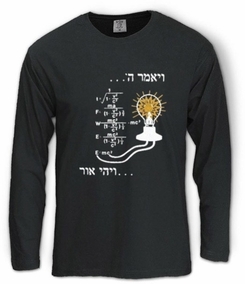 100% cotton T-Shirt with high-quality print on front of equations that display the famous "E=MC2", and a lamp lit with holy "Let there be light" quote written in big font. Our t-shirts are made of 100% cotton and are long lasting with bright colors. Our products are all designed and printed in Israel.